There’s been some tightening of the belt recently but the skinny is not in the back pocket, it’s around the waist. Many designers cinched in and accented the midsection for this season. Now’s the appropriate time for dapper gents to pull their pants up high and proudly show off being able to put one more notch in their belts. 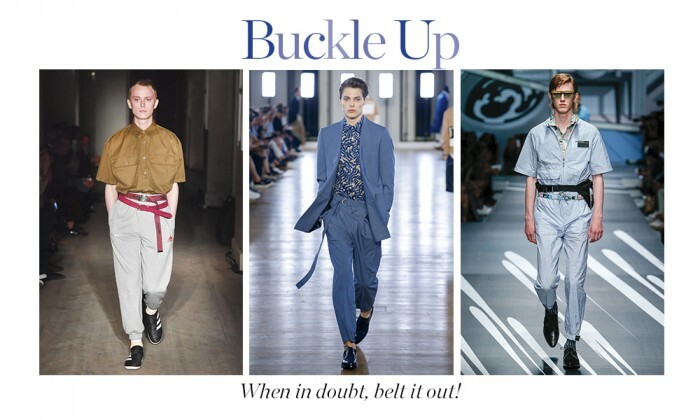 The extra long belt (that in some styles skims the ankle) is next-level. At CERRUTI 1881, a D-ring belt kicks up a classic lightweight, cotton suit for a look that’s effortlessly polished with a rebel yell. Belts that buck tradition provide a savvy, if not ironic edge. The expectation that everything a man carries should fit into his back pocket seems unrealistic and, frankly, outdated. Still, a full-sized bag is not always entirely necessary either. The chicly renamed “belt bag” (that some might liken to a more sophisticated reincarnation of a fanny pack) rises to the challenge. 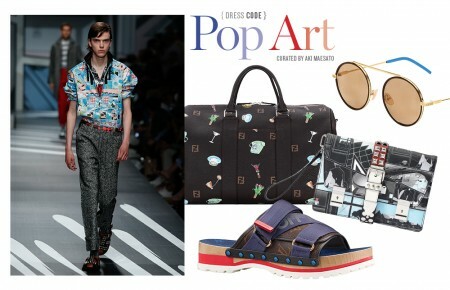 PRADA’s comic print was a personal favorite—after all why not go a little more biting with your fanny pack…I mean belt bag? GUCCI played it cool by combining the classic black leather belt with a little quilted pouch. Those who dare to push the limit further should double down to be firmly seated on the trend. GOSHA RUBCHINSKIY didn’t feel a need to stick with similar styles. The designer chose to layer a conservative leather frame design with a sporty belt in matching red hues.